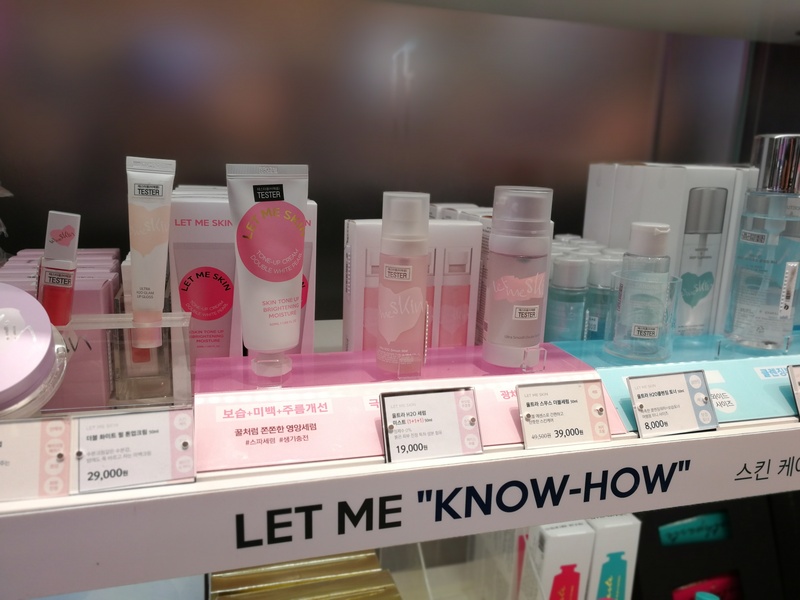 The first stop on my Asia trip this May was Seoul, for Cosmobeauty 2018 trade show (check out my trade show review here) but also to do my customary store research. This is something I do whenever I travel; even if I have visited the country/city before. 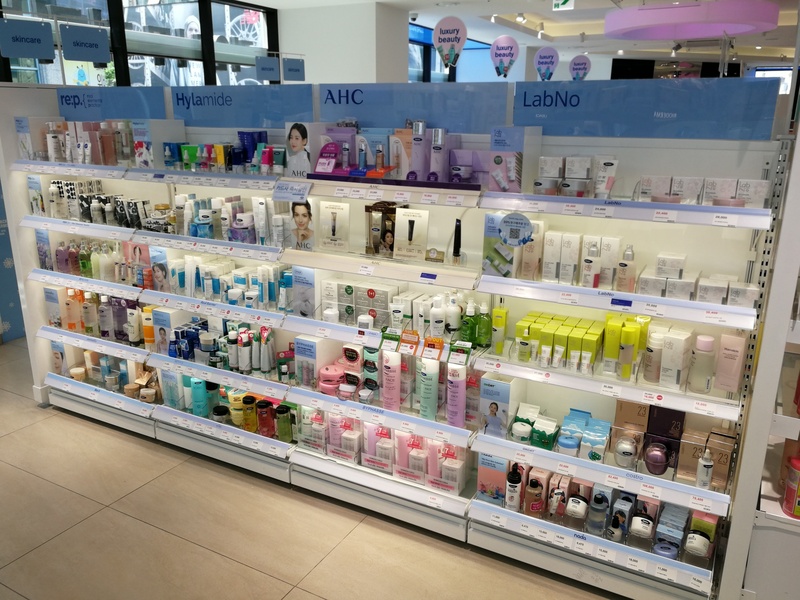 I visit as many health & beauty retailers as possible; at least one chain per distribution channel: drugstore, perfumery, department store, organic store (or equivalent) and whatever specific retail channel a particular country might have. And then I spend hours in-store until the security staff and/or sales personnel is starting to give me suspicious looks ; ). 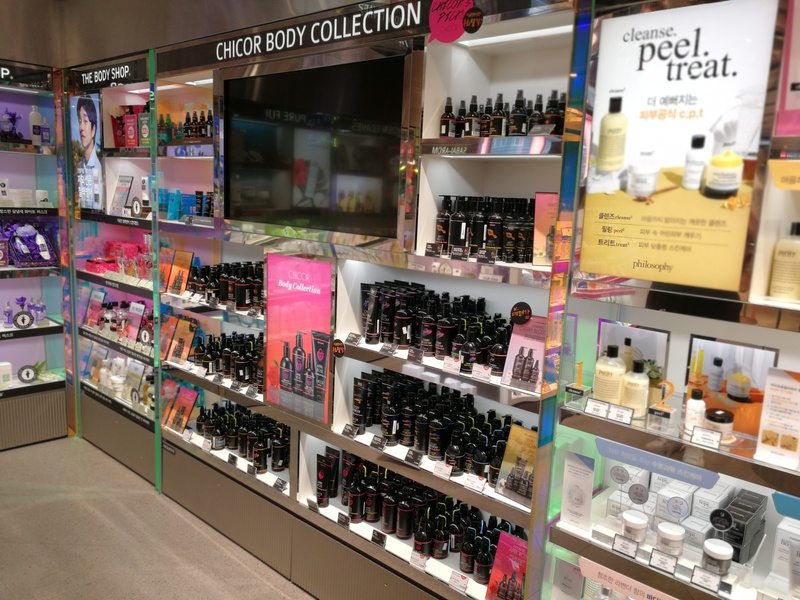 I’m checking out the products that are displayed on the shelves: are there any interesting new beauty launches – any new key ingredients? Product types? Packaging designs? Does the retailer have any own label brands and if so, what do they look like? Is there just one own label range or a diversified portfolio of proprietary product ranges? What is the overall percentage of domestic brands vs. international brands? And what do the retail chains look like; do they offer any in-store services, features or activities to make shopping in a bricks ´n mortar store more exciting? 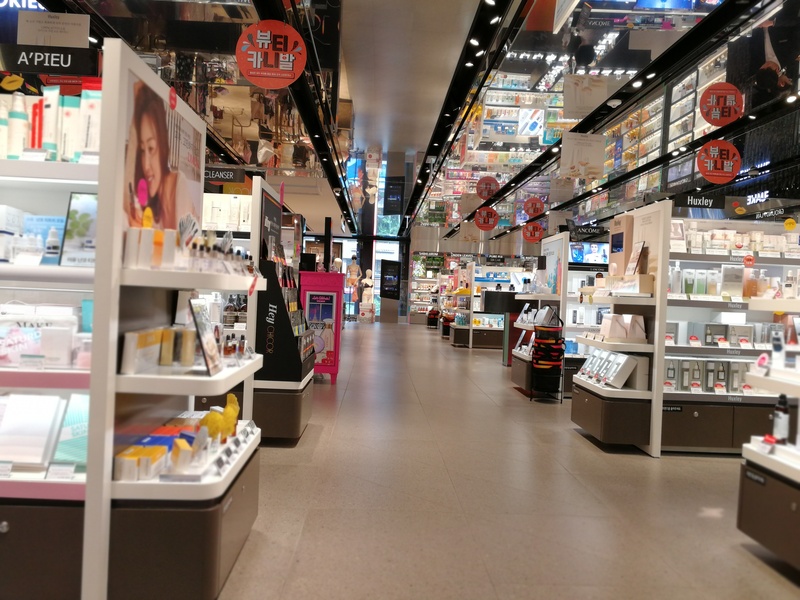 This was my fifth visit to Seoul and after the first couple of days I was struck by how rapidly the Korean beauty retail market is changing at the moment. And it all started less than two years ago. There are three (!) 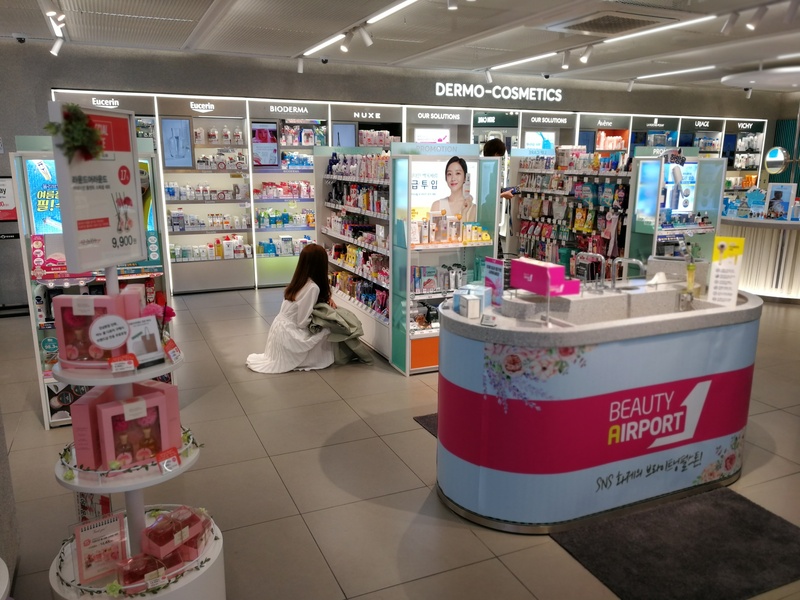 new beauty retail chains on the market which offer a European-style perfumery multi-brand concept (and for the Korean beauty market this is is nothing less than revolutionary – again, more info on this in the article!) 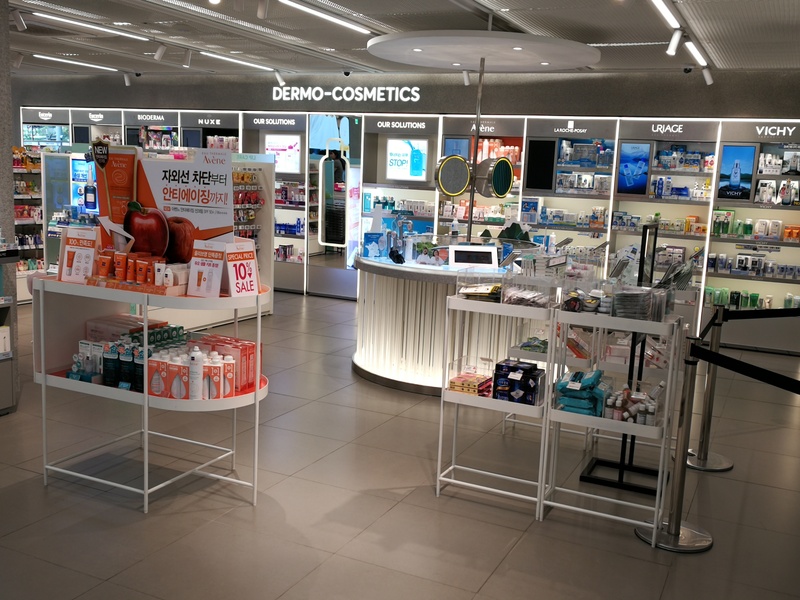 while drugstore market leader Olive Young is hastily refurbishing its stores across the capital in a scramble to keep up with all of the new competitors. 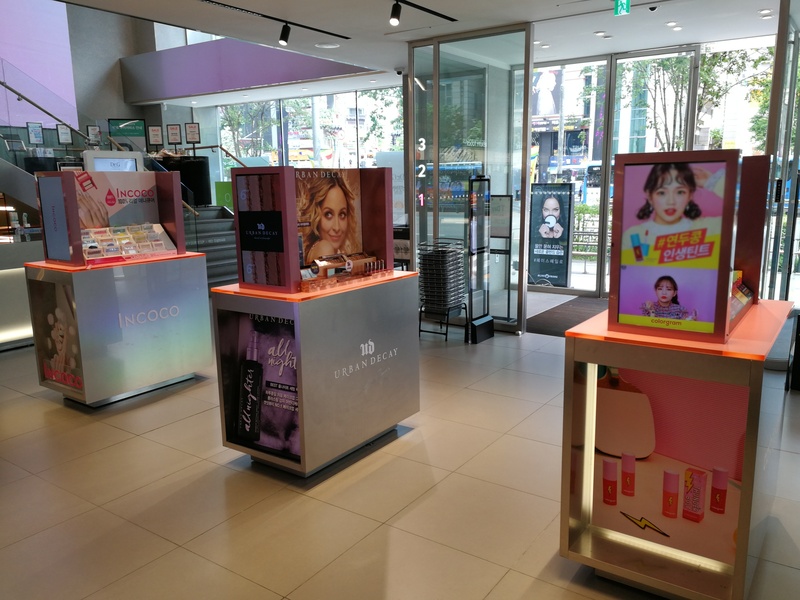 One week was barely enough to visit all of these new retailers and because so much is happening in the Korean beauty market at the moment, I think it is time for an overview article on all of the new beauty retail chains (with plenty of high-res pictures, of course). 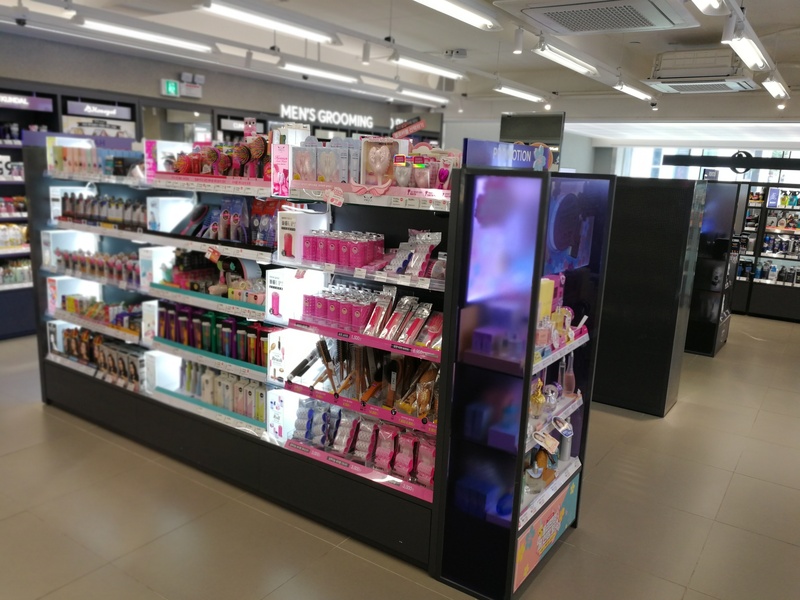 Let‘s start with a very brief (and simplified) history of the Korean beauty retail market: up until maybe ten years ago the classic beauty retail format was what the Koreans call “mono brand“ stores – these are retail stores that only sell the products of one specific brand. Like The Body Shop or Yves Rocher over here in Europe. All of the big K-Beauty brands – Innisfree, It’s Skin, Etude House, Tonymoly, Holika Holika, Too Cool for School, Skin Food etc. – have their own brand stores; very often these are located right next to each other. Like in Myeongdong, the famous beauty shopping area in Seoul. Then you have so-called “multi brand“ stores: drugstore chain Olive Young (CJ Group), for example, the Watsons chain (AS Watson Korea, now GS Retail) or LOHBS (Lotte Group). These retailers sell a wide range of different beauty brands, with a strong focus on mass market personal care. The Aritaum chain is a multi-brand retailer of sorts. However, the company belongs to Korean C&T giant Amorepacific and only sells Amorepacific brands. No foreign“ brands. Then there are the department stores, a thriving distribution channel in Korea. The three leading chains here (in order of importance) are Lotte, Shinsegae and Hyundai . Japanese-Korean Lotte group dominates most consumer goods and retail sectors in Korea (and Asia): they own food/confectionery manufacturers, retail chains, hotels, amusement parks, cinema chains, malls, hotels and housing complexes plus numerous other business divisions. In the department store sector, Lotte runs the Lotte department stores, Lotte Mart, Lotte Duty Free and various other Lotte retailers. Shinsegae operates around 13 stores at the moment, plus the E-Mart convenience store chain and the Starfield malls. They also own the franchise for Starbucks Korea and, just recently, aquired the Korean franchise rights for UK retailer Boots (more on this below!). Plus, they launched the Chicor perfumery chain (again, more info further down the article!). And Hyundai currently runs around 13 department stores under the Hyundai store brand, plus several D-Cube City stores and a number of U-Plex department stores. 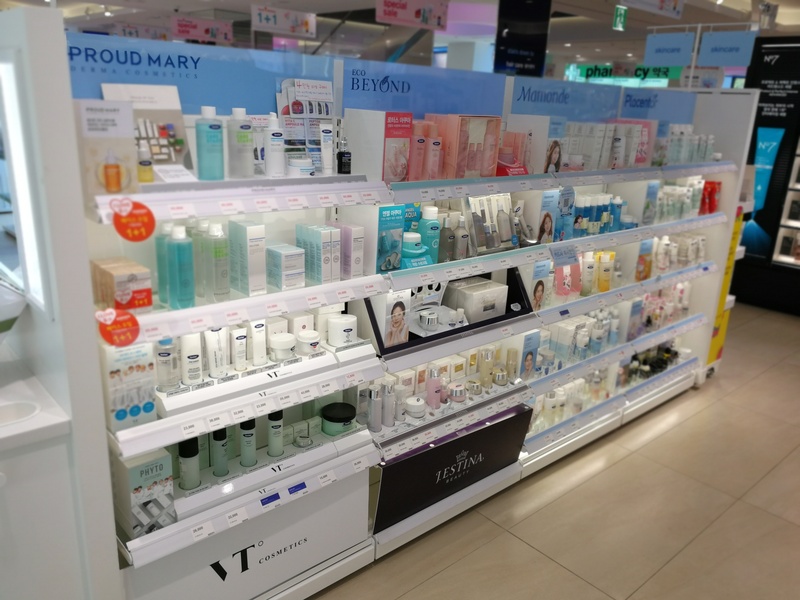 However, the beauty departments of Lotte, Shinsegae and Hyundai look more or less identical: the usual premium mainstream beauty counters of Western, Korean and Asian beauty brands – SK-II, Chanel, YSL, Clinique, Sulwhasoo, Estée Lauder and so on, plus shop-in-shop boutiques from various international and Korean beauty brands. 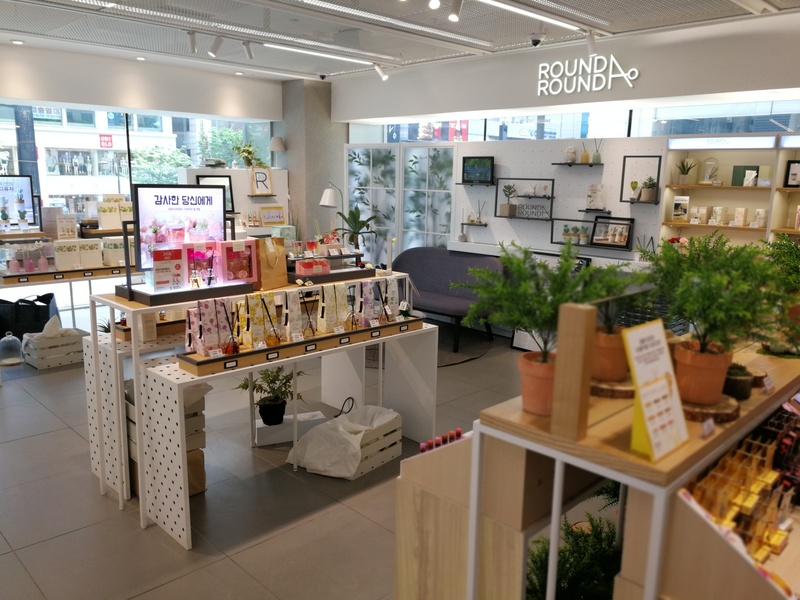 And if you were visiting Seoul and wanted to discover a wider range of domestic and local beauty brands rather than the big international names you see everywhere, your only option was to visit one of the drugstore chains. For a very brief time Seoul had the Belport perfumery chain (a true European-style multi-brand perfumery – I wrote a store profile on Belport three years ago) but Belport has since disappeared from the market, I think, their Garosugil flagship was renamed A.G.B. almost two years ago. Anyway, this was the situation up until a couple of years ago. Leaving out the department stores and mono brand stores, the only multi brand beauty retailers around were Olive Young (the Korean drugstore market leader with around 950 stores), Lotte-owned LOHBs (around 96 stores across Korea, including stand-alone stores and shop-in-shop retail spaces) and the Boons Apothecary drugstore chain which used to have a fantastic store in Gangnam but that outlet closed down (it’s a sport fashion store now, I forget which brand). 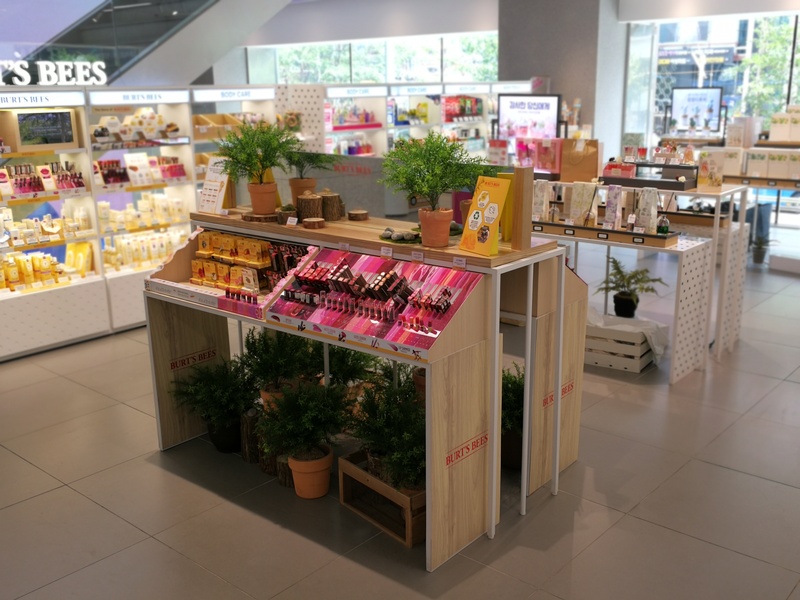 Interesting fact: Boons was department store retailer Shinsegae’s first foray into the beauty retail market back in 2012. However, from what I’ve read in the Korea retail media, Boons hasn’t done so well over the past few years. 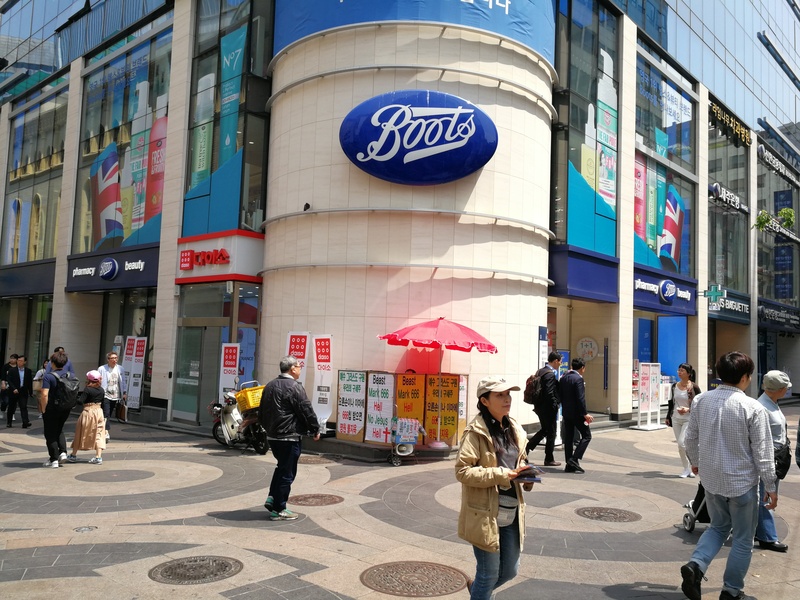 With the arrival of Boots, the remaining Boons stores will be closed down or turned into Boots outlets and the Boons brand will disappear from the Korean retail market. RIP! But there’s no need to mourn: now there’s a whole clutch of brand-new perfumery retailers to have fun with! In fact, let’s call this new generation of Korean beauty retailers “playground perfumeries” because this is exactly what these new chains offer: super stylish multi-level retail spaces that feature the latest in Korean indie, niche and luxury beauty as well as the trendier Western beauty bestsellers (think Bobbi Brown, MAC and Urban Decay rather than Chanel or Dior). 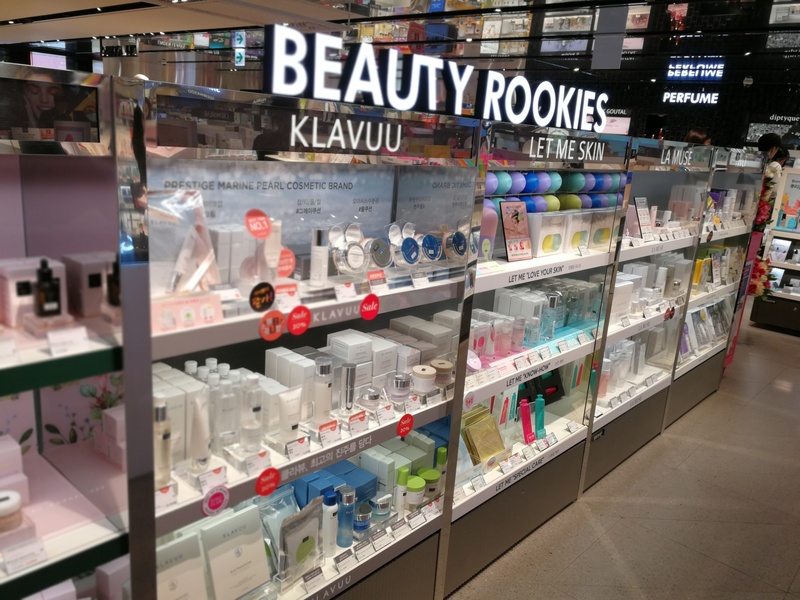 Let’s start with Shinsegae’s first new beauty retail operation: the Boots chain! 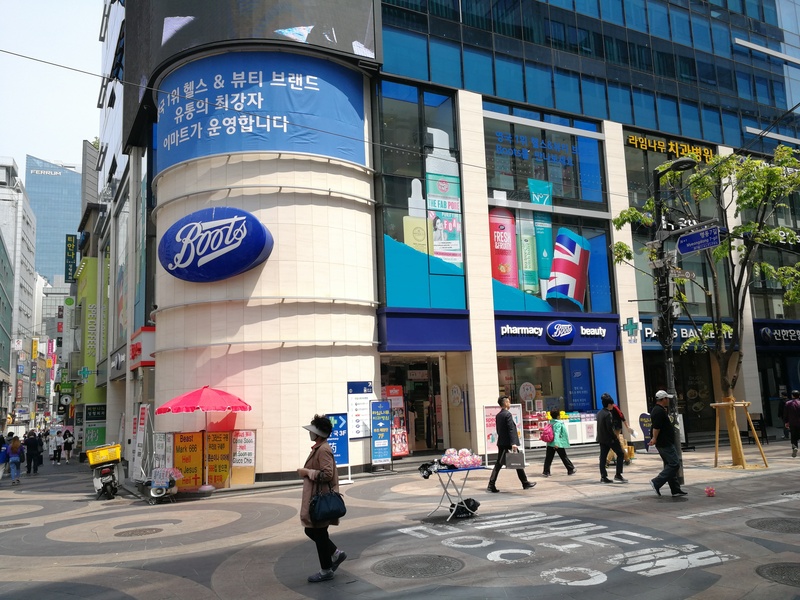 In May 2017, UK drugstore retailer Boots entered the Korean market as a franchise business operated by Shinsegae group. The first Korean Boots store was really small (I actually came across it by accident last May in Seoul – I was looking for a Boons store which wasn’t where the Internet said it was. And all of a sudden I see the Boots logo). However, over the past twelve months the Boots chain has really pushed forward its expansion. There are currently 10 Boots stores in Korea (most branches are located in Seoul) but the most spectacular outlet is the three-story Boots flagship store which was opened right in the middle of Myeongdong this January. Let’s check out the new Boots flagship. 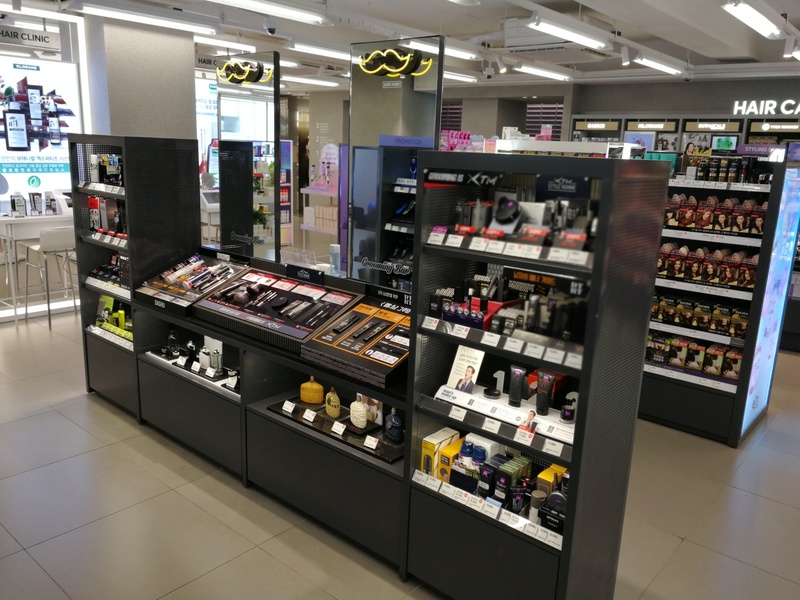 It’s a beautiful store with three retail floors: the ground floor features colour cosmetics and some of Boots‘ own label body care brands. The second floor was particularly interesting: this is where you’ll find the majority of skin care brands including a slew of new and/or indie K-Beauty brands, such as Aquatop, re:p (a sister brand of Neogen), LabNo, OkCat and A24 (organic aloe vera beauty, one of my personal favourites. Not quite super new but really hard to track down so I’m counting A24 a niche brand!). 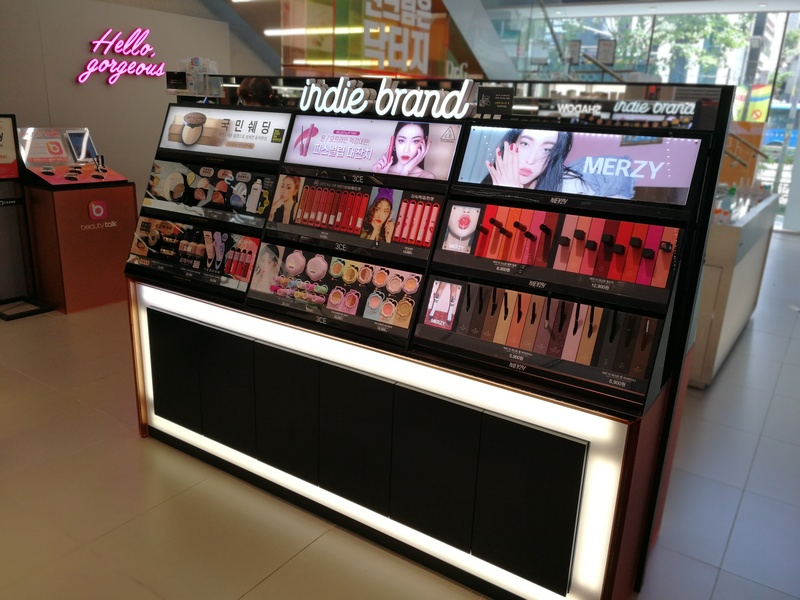 EXCURSUS: That’s another thing I noticed on my Seoul visit: the popularity of domestic indie beauty brands which neatly reflects the worldwide indie beauty trend. Contemporary indie brands, no matter what country they come from, are fairly easy to recognise: they usually have a „clean beauty“ and/or natural positioning with apothecary-style packaging or, alternatively, an ultra-stylish minimalistic look. In fact, I don’t even need to understand the language of the packaging copy; usually the design, layout and colours are expressive enough! The new generation of perfumery retailers – Boots, Chicor and Lalavlas but also Olive Young – are highlighting these beauty brands in special displays, usually marked with the English-language “indie“, “niche“ or “newcomer“ (in the case of Chicor Gangnam, the shelf is called “Beauty Rookies“ which is kinda cute). 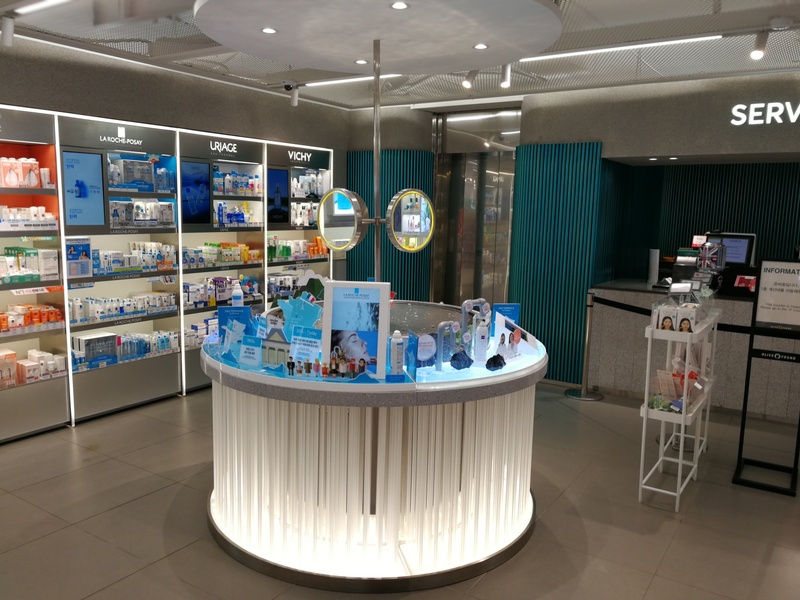 The second floor of Boots Myeongdong is dedicated to skin care, hair care and body care as well as supplements, health beverages and nutritional products. 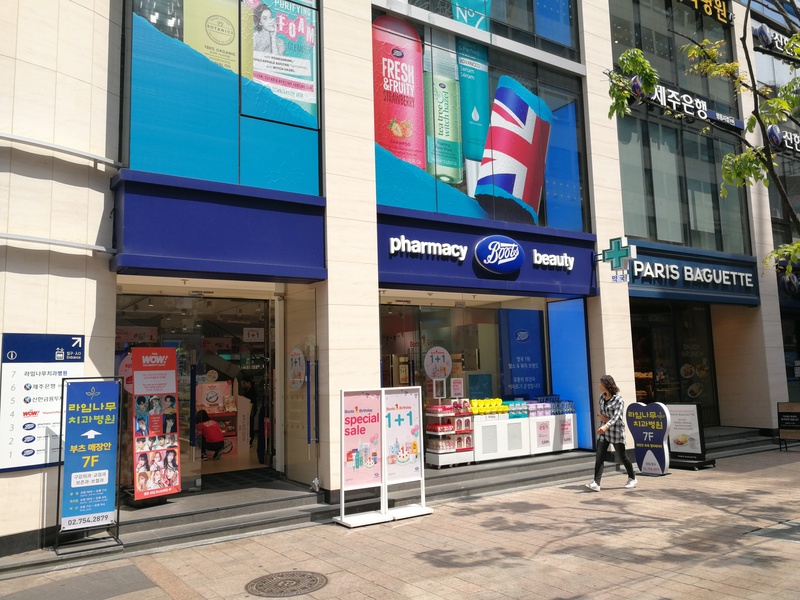 The brand mixture is interesting: Boots Korea sells all of Boots‘ international own label bestsellers – No 9, for example (face care, body care, colour cosmetics), Botanics and Boots Essentials but also well-established UK brands like Simple, Neal’s Yards Remedies, Liz Earle and Soap & Glory. 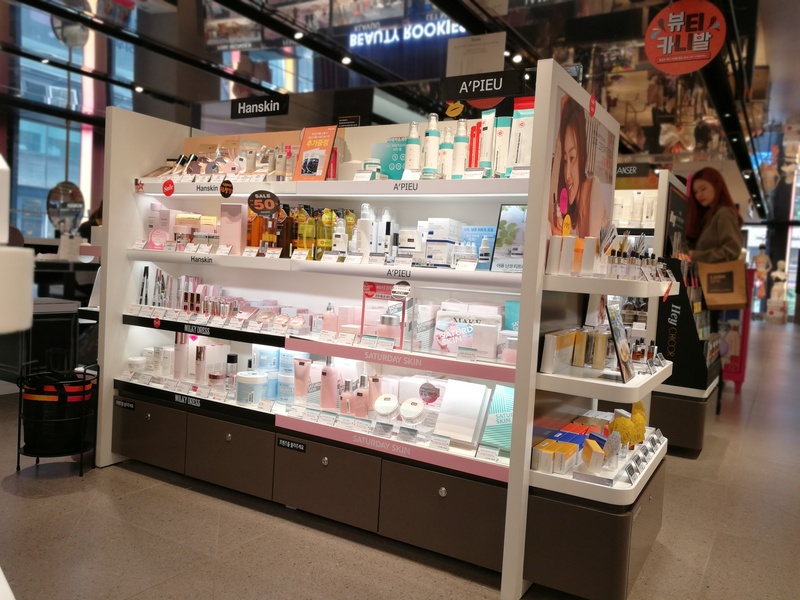 Plus a shed load of Korean beauty brands (with a strong focus on new indie brands, see above), Japanese stalwarts like Hada Labo and DHC and, of course, the Western brands that any Korean consumer would expect to find in a drugstore: L’Oréal, Nivea, Neutrogena et al. 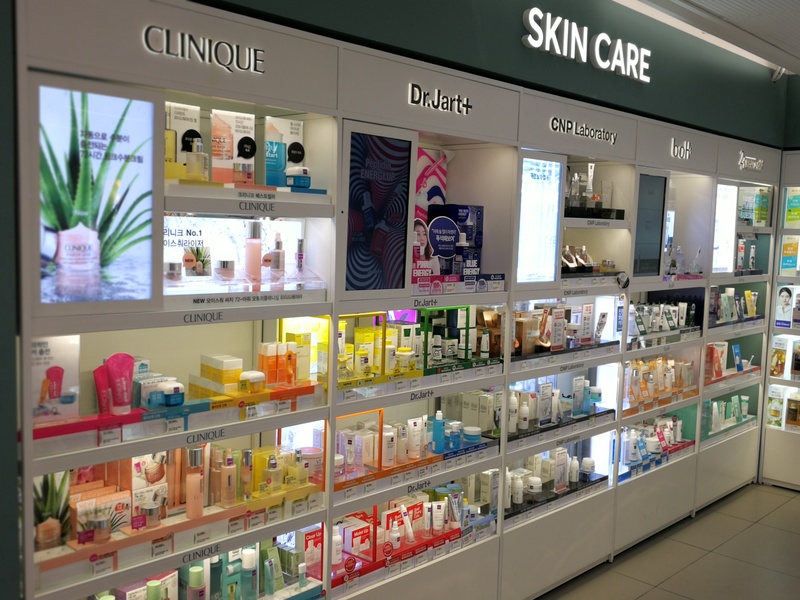 The store also sells Western luxury bestsellers like Origins, Clinique, Clarins and Biotherm and all of the uusual French pharmacy labels– Avène, La Roche, Bioderma, Vichy etc. – which are presented in a separate shelf area. 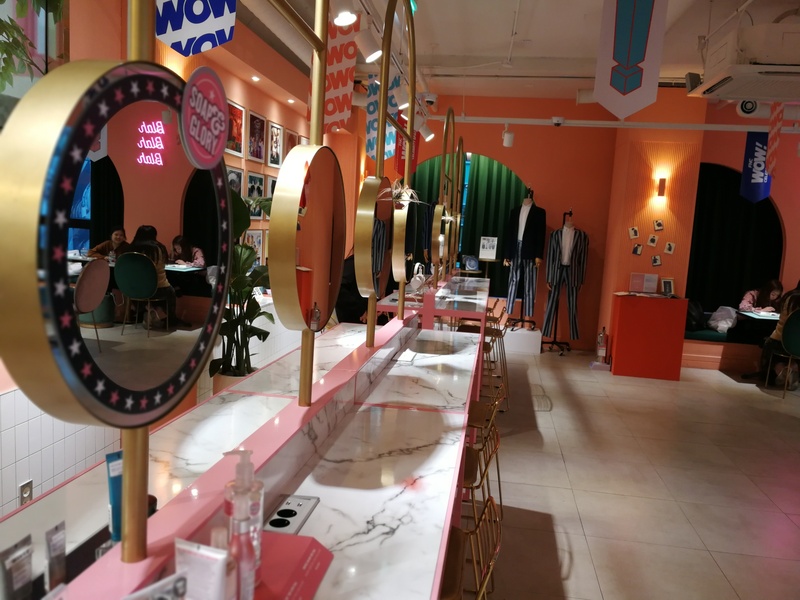 The top floor of the store is dedicated to a K-pop café – almost de rigueur in Korea, a market in which the majority of consumer goods brands are sold on the back of the enormously successful K-Pop and K-Celeb industry. Add free wifi throughout the store and plenty of product testers on the shelves and you have a very attractive beauty store indeed. 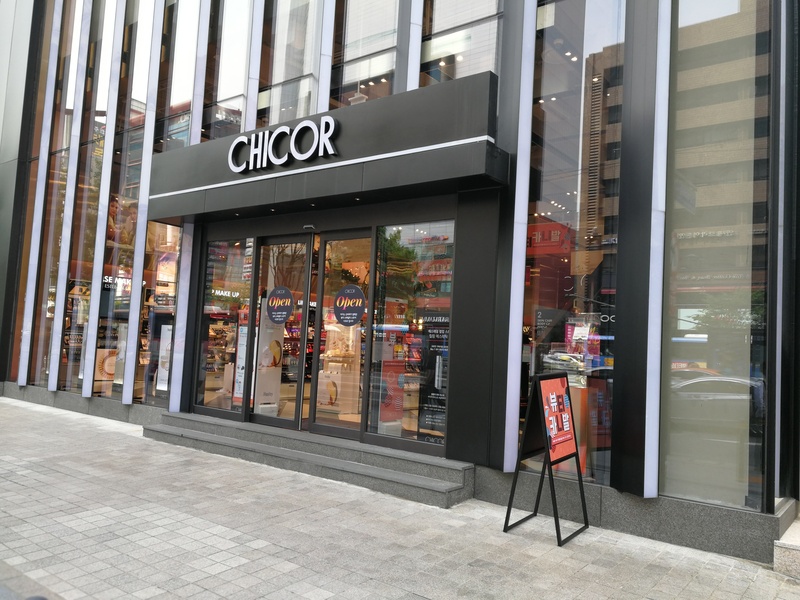 The second new retail chain in Korea is Chicor, a European-style perfumery chain launched by Shinsegsae in late 2016. 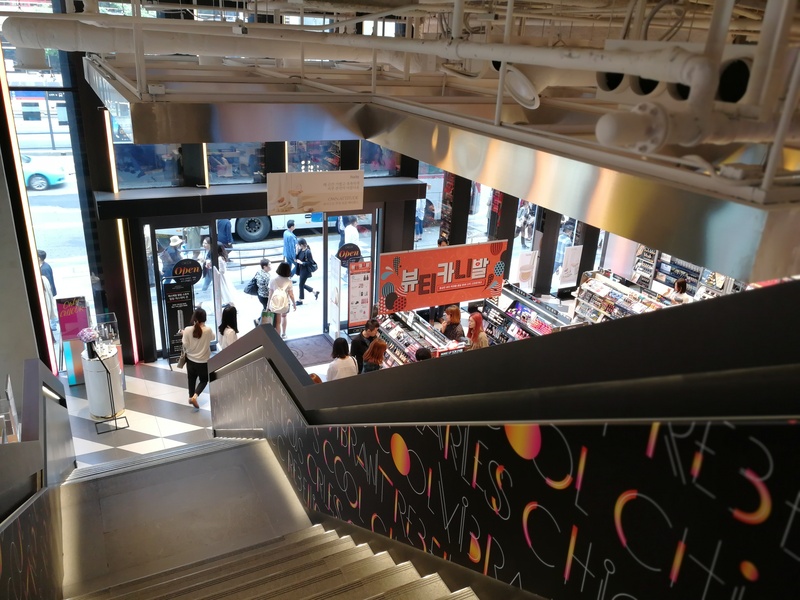 There are currently five Chicors in Seoul – all located in Shinsegae’s department stores or malls – plus the new flagship which Shinsegae launched in late December 2017. This outlet is the Chicor chain’s first stand-alone store and it’s a truly spectacular retail space (Sinneonhyeon station, exit 6). As you can see in the pics above the glass-fronted entrance is huge! 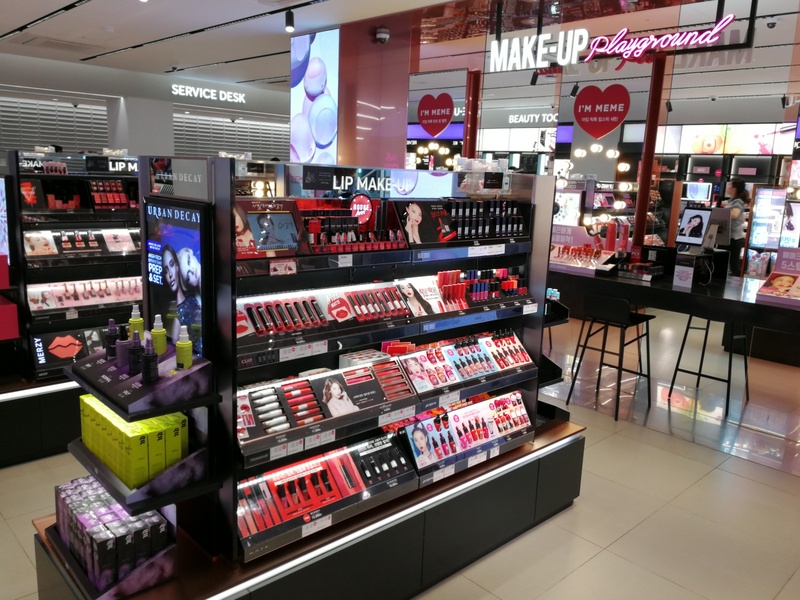 Once you enter the store you are right in the middle of the colour cosmetics area. 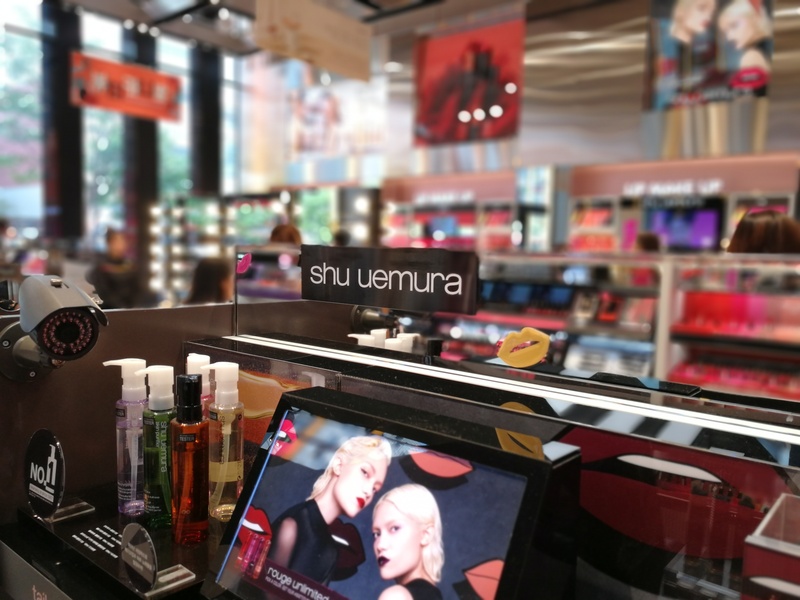 There are makeup counters everywhere; from big Western brands – Bobbi Brown, Makeup For Ever, MAC, Urban Decay, Nars and Benefit – over Shu Uemura and Shiseido from Japan to Korean trend labels such as I’m Meme, Dejavu, Espoir, 3CE, Sixteen Brand, Chongsungah 22 and VDL. 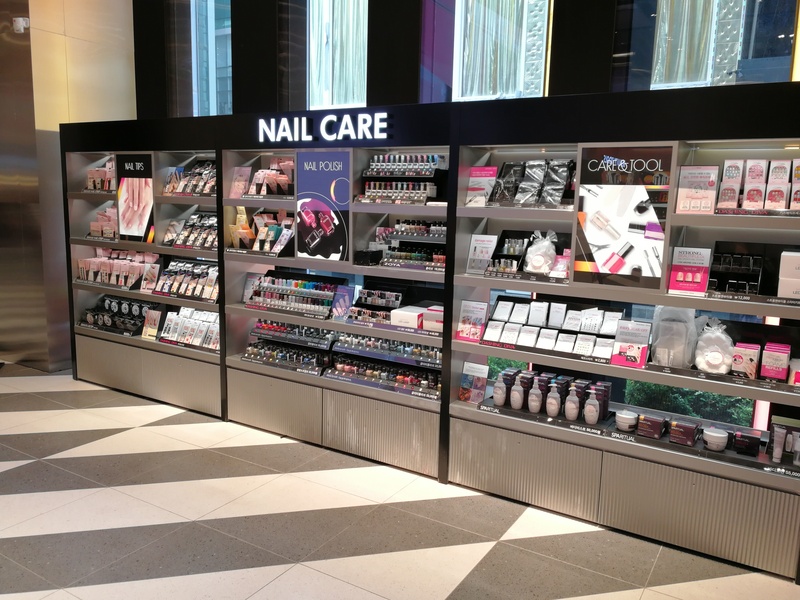 Plus an entire wall full of nail polishes and other nail care products (including brands like Dashing Diva, Spa Rituals and Deborah Lippmann) as well as makeup accessories and tools. 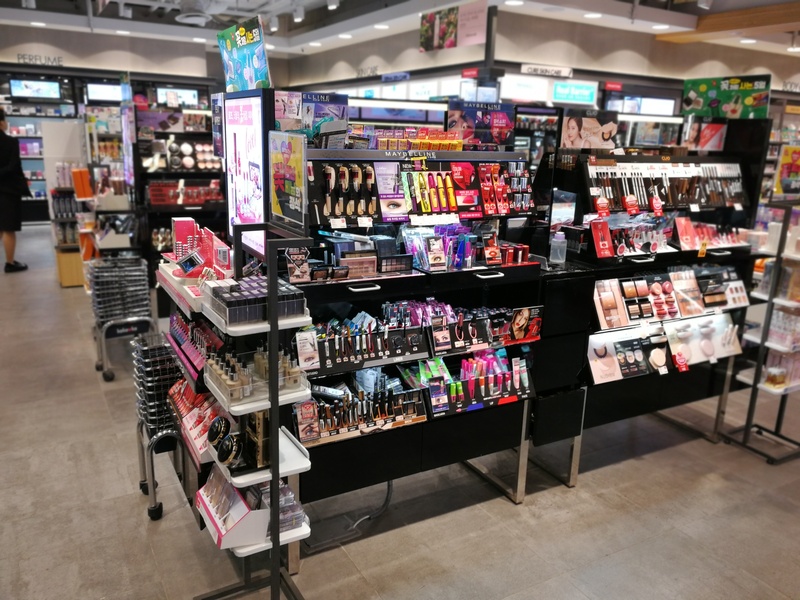 This Chicor outlet also has resident makeup artists that offer makeovers to shoppers – the makeover stations are also located in the colour cosmetics section which makes it one of the most crowded areas of the store. For me the first floor (or F2 as it was numbered; in Korea – as in most Asian countries – the ground floor is called 1F. Sort of like we do in Eastern Berlin!) was the most interesting section of the store: skin care! Mostly Korean brands (comparatively little mainstream, I was impressed!) 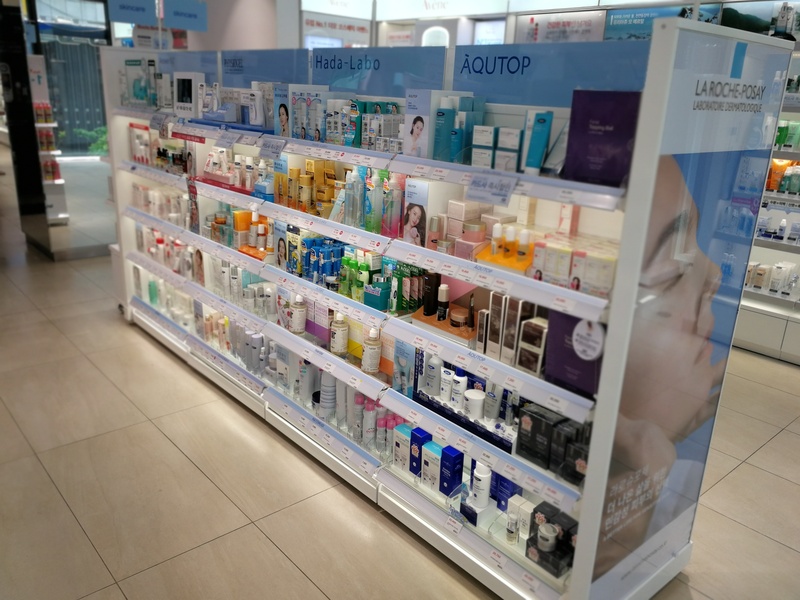 with a line-up that ranges from big brands like Belif, Primera, Holika Holika, A’Pieu and Hanskin to smaller labels like Ground Plan, Aprilskin, Huxley, Klairs and Bonajour. 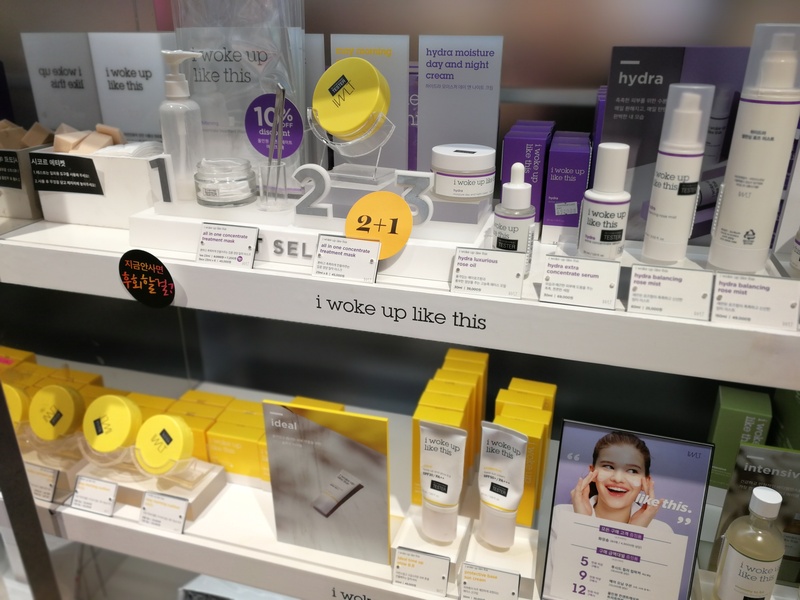 I noticed that many of the face care brands available at the Chicor had a strong natural/apothecary positioning/slant – the indie beauty trend at work again! A prominent „Beauty Rookies“ shelf with newcomer and indie brands showcases beauty labels like Femmue, I Woke Up Like This and Klavuu. 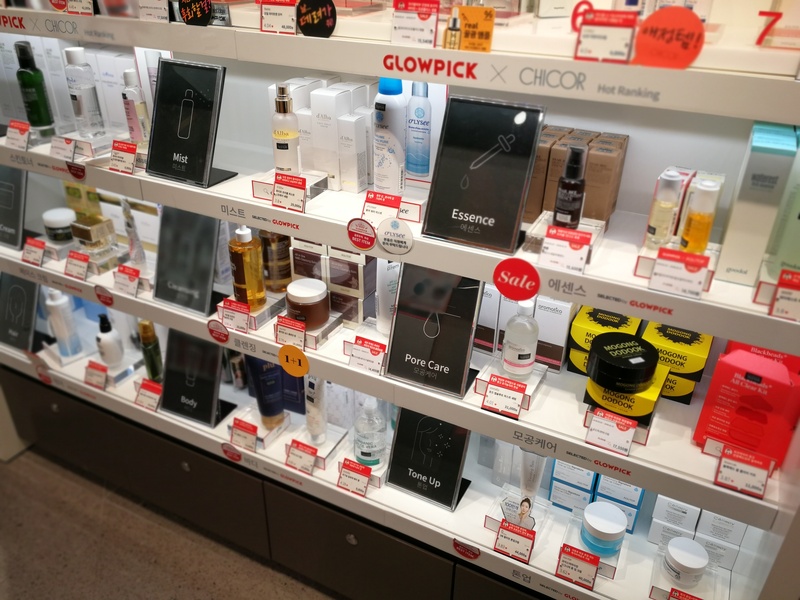 On this floor you can also find the Chicor x Glowpick shelf which features the top-ranking beauty products from Glow Pick, the most influential Korean beauty product review media app. 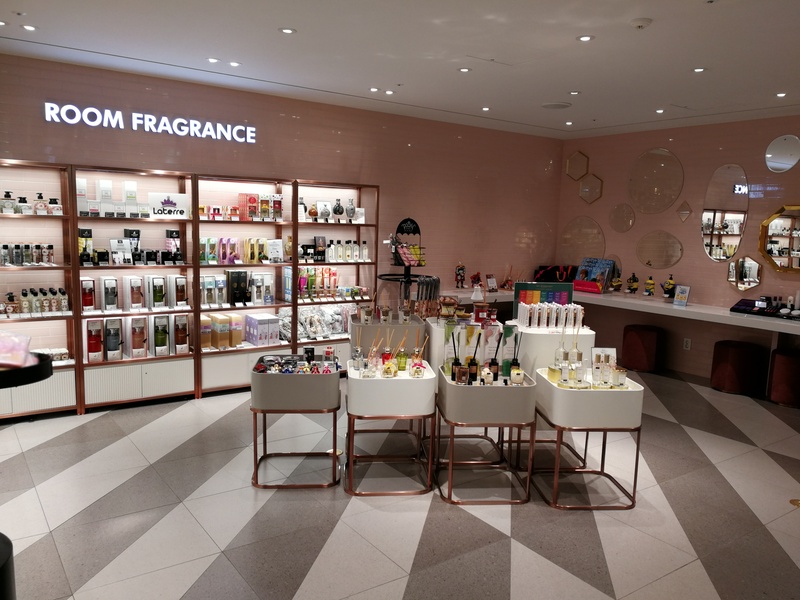 Also on this floor is fragrance – not particularly exciting; all of the international mainstream perfume labels that you’d expect in an Asian country – and body care products from a range of international and Korean brands. I’m not particularly interested in body care either so I only snapped a couple of pictures of Chicor’s own label body care range (see pic below) and moved on. 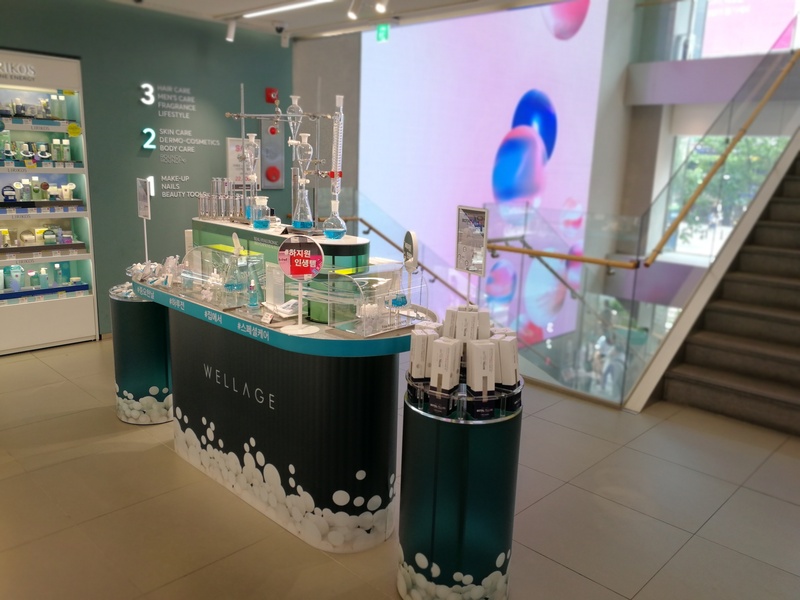 Speaking of own label: as part of the Shinsegae group’s business expansion strategy the company is also driving forward its own label cosmetics production. Businesskorea.co.kr has just reported that Shinsegae will launch an own label skin care brand this August. Products will be based on plant extracts (hanbang maybe? Or even natural?) and the brand name will most likely be Yeonjak. Exciting! I’ll keep an eye on that. 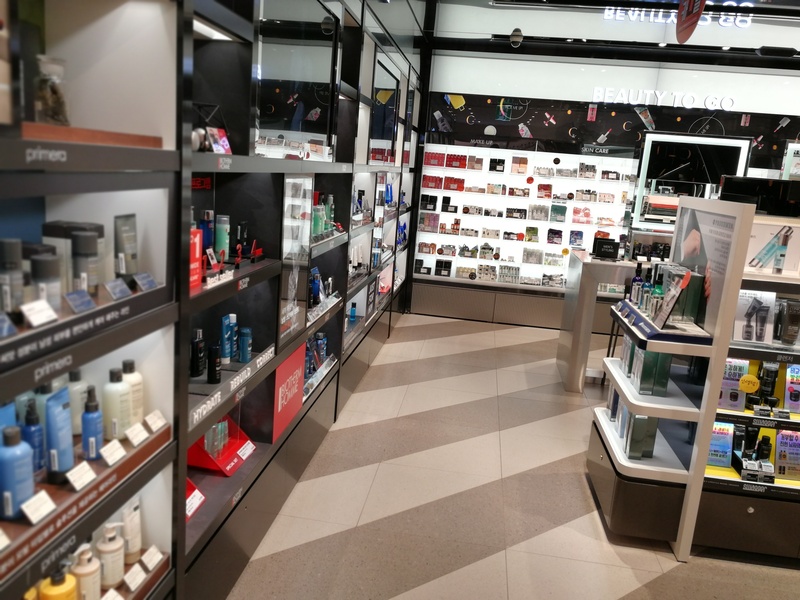 Now follow me to the basement: here we find home fragrances, travel sizes and other lifestyle products (some stationery, beauty gadgets, confectionery) and the men’s department – men’s fragrances, skin care, shaving, beauty tools and accessories. The product line-up includes the men’s care ranges from Western brands such as Origins, Lancôme, Biotherm and Clinique but also men’s products from Korean female beauty brands like Primera, and dedicated Korean men’s care brands like Swagger. 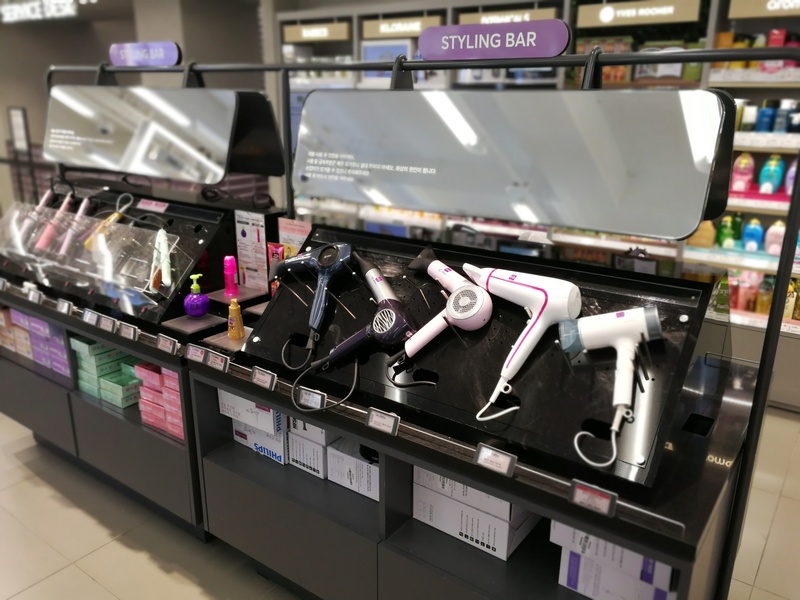 This level also features hair care and styling, including a styling bar which allows you to try out different hair driers, curlers, straightener and other heated styling tools. I first saw this kind of store feature in the big Olive Young in Myeongdong on my first visit to Seoul in 2015. It’s such a brilliant idea! To sum up: I can absolutely understand why all of the beauty bloggers in Seoul have been raving about this Chicor, it’s a beautiful store! 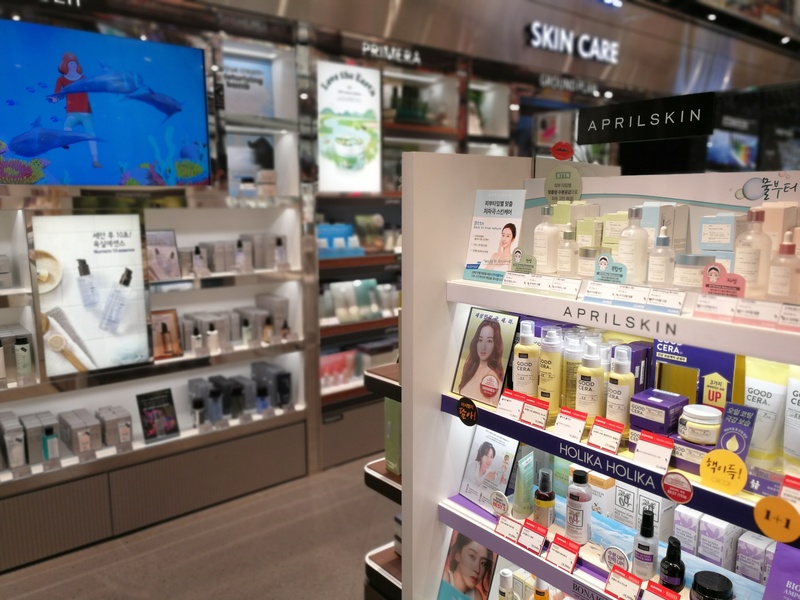 The third new beauty retailer is Lalavla, the health & beauty chain formerly known as Watsons – yes, THE Watsons, Asia’s health and beauty market leader. The Watsons chain is ubiquitous in Asia. If you travel anywhere in the region you will recognise the pale turquoise coloured store logo. 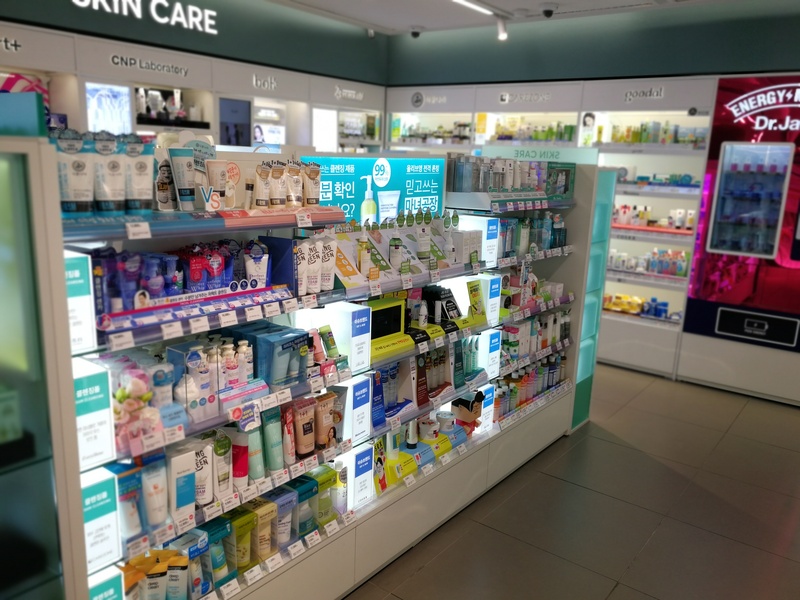 Watsons is the flagship chain of the AS Watson group, which in turn is the personal care division of Hong Kong’s retail conglomerate (CK Hutchisons Holdings (a.k.a. Hutchison Whampoa)). 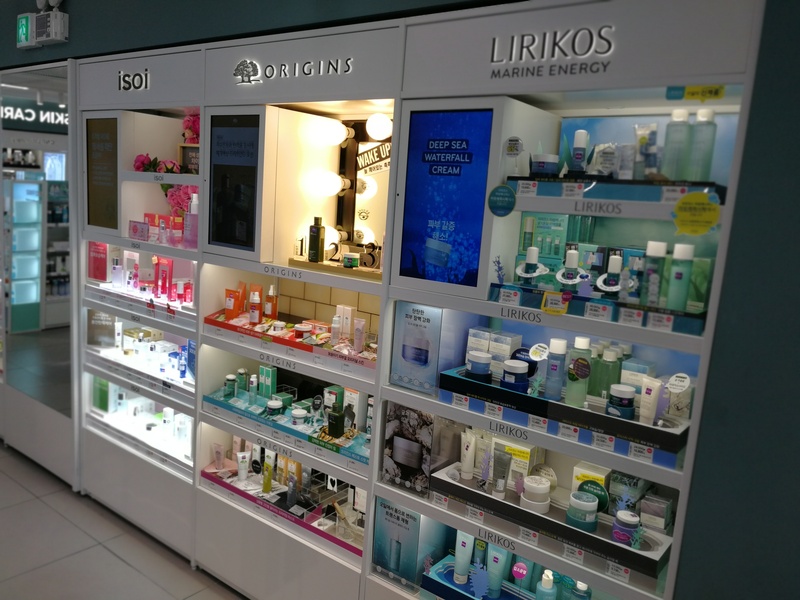 AS Watsons operates 6,600 Watsons stores in 11 Asian countries plus some outlets in Turkey. The most recent regional market for the Watsons chain is Russia, by the way; the first Russian Watsons outlet opened in St. Petersburg this April. AS Watson also runs health & beauty chains in 15 further countries across the world. In fact, the company is the biggest health and beauty retailer in Europe. Over the past two decades AS Watson has quietly purchased most of the major European drugstore chains – they own Superdrug, The Perfume Shop and Savers in the UK, the Marionnaud and ICI Paris XL chains in France; Drogas in Latvia, and Kruidvat and Trekpleister in the Netherlands and Belgium. They even acquired 40% of the shares of the German Rossmann drugstore chain. 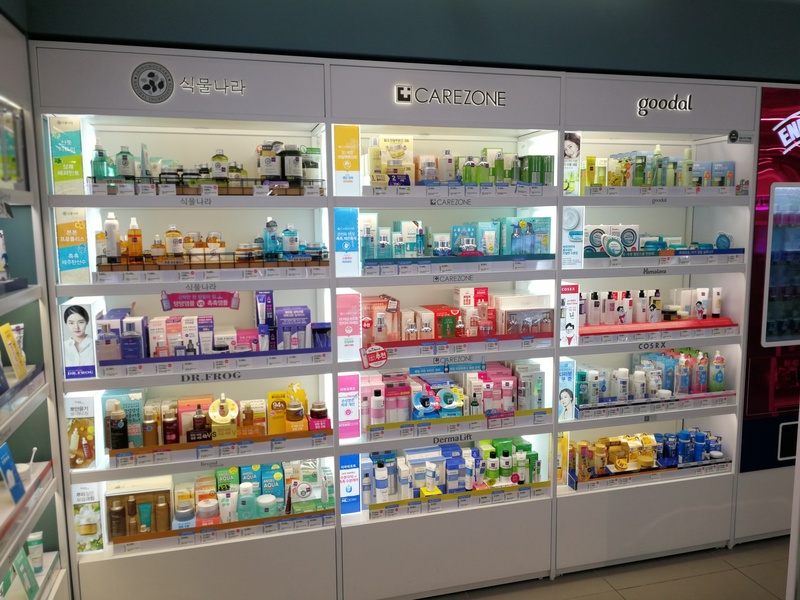 Anyway, Watsons Korea started operations in 2005 as a franchise in cooperation with Korean retail group GS Retail. However, business was never particularly successful – probably also because of stiff competition from the domestic drugstore market leader, CJ group-owned Olive Young. 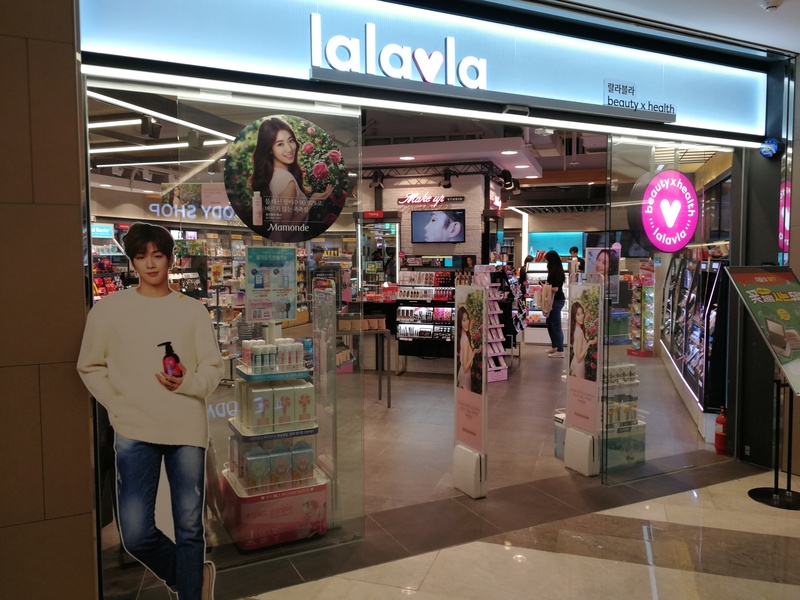 In 2017 GS Retail bought the remaining Watsons Korea shares from AS Watson and this February, the company rebranded the Watsons chain as Lalavla to draw in a younger demographic. The Lalavla chain (this might be an urban tale but I read that the store name is a hybrid of „lalala“ and „blablabla“ – presumably this sounds attractive to Korean millenials?) is sporting an eye-catching black and pink store logo with a heart placed prominently inside. 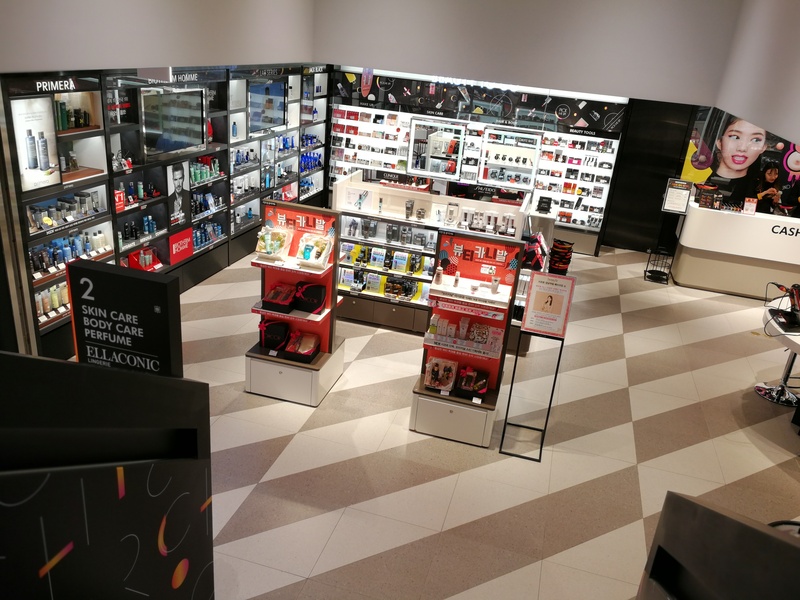 The stores were completely revamped inside and the brand portfolio updated to include teen-oriented trend beauty brands and niche cosmetics rather than Watsons’ usual mass market personal care products. 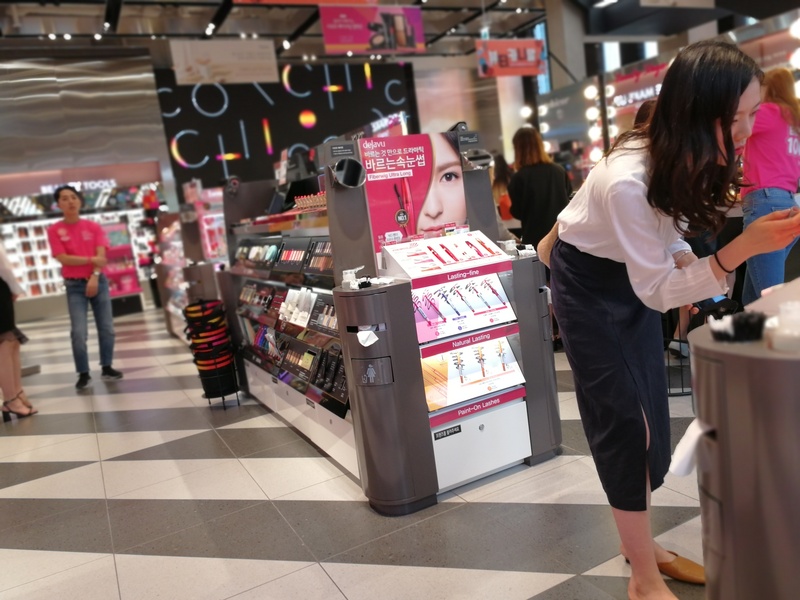 The Lalavla stores offer generous makeup testing counters and product testers on the shelves; just like you’ll find in the Chicor stores or in the new, larger Olive Young outlets in Seoul. The Lalavla stores I visited have the „normal“ small-to-medium drugstore size; no three-story retail extravaganzas here but I assume that this won’t be GS Retail’s priority anyway. 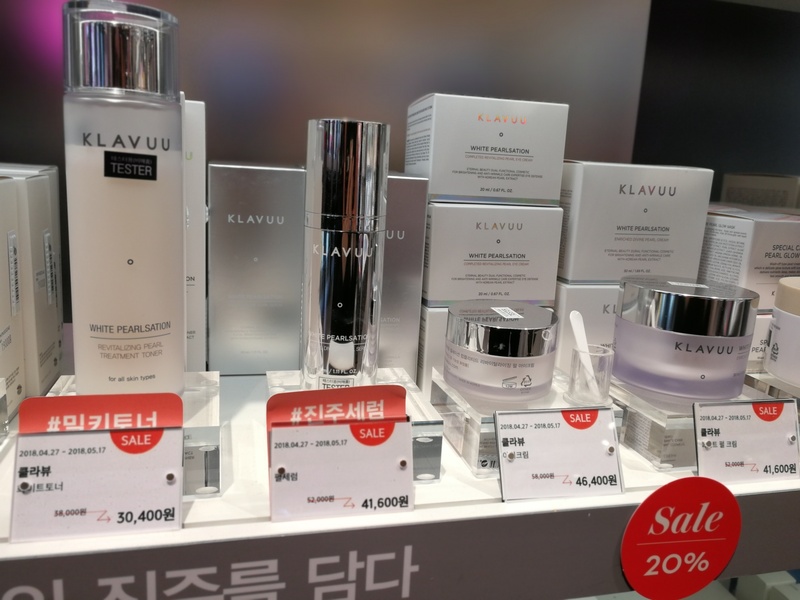 Watsons operates around 188 stores in Korea – I read that around 60 of these outlets were opened in the second half of 2017 alone and I would imagine that almost all of these will be rebranded as Lalavla. 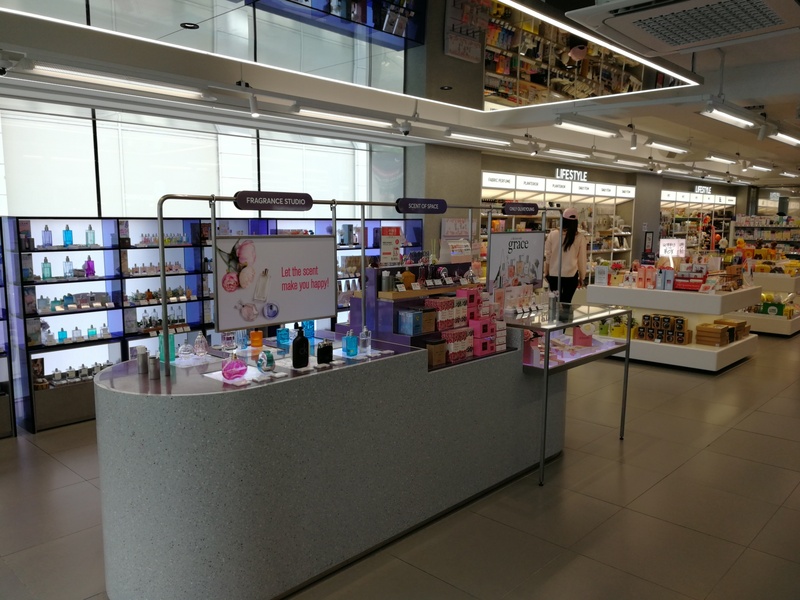 The chain is obviously intended to be a competitor to Olive Young’s normal-sized drugstores, without trying to compete with large-scale premium perfumeries like Chicor. And I should think that they’ll do this very successfully; I really liked the Lalavla outlets that I saw – they are attractive, fun and modern beauty stores. EXCURSUS: This is a fascinating new retail trend – „untact retail“. This term refers to stores where the customers is left alone by sales assistants and other store staff. In Asia, customer service is traditionally very important. And in most Asian countries, when a customer enters the store, a member of the sales staff will immediately appproach him or her and then follow the customer around the store, ready with advice or help if necessary. Me, I hate this; having someone hover near your shoulder talking at you whilst you are looking at products really spoils the shopping experience for me. I want peace and quiet to look at things at my own pace; if I need help or I have a question I will ask a member of staff. Having said that I do realise that this kind of staff behaviour is considered good customer service in Asia. And in most cases it is possible to ignore persistent sales people, at least for a while. However, in certain cities – Seoul, for example, and Myeongdong in particular – “service-oriented” can turn into “super-pushy” very quickly. In Myeongdong, the neighbourhood in Seoul that is often called „beauty capital“ thanks to its high density of cosmetics stores, most of the beauty stores have sales staff standing outside on the street trying to lure shoppers inside. And once you enter a store the hard sell begins. Mind you, Myeongdong is one of the most popular Seoul neighbourhooods for Asian shopping tourists, especially tourist from mainland China but also from the Middle East, the Indian Sub-Continent and Europe. These beauty tourists often buy cosmetics in bulk. And as soon as store staff see a foreign or touristy-looking face they will approach you and try to sell you stuff. Interestingly enough this seems to happen to Korean shoppers too and many Korean beauty consumers are apparently fed up with this hard sell tactic. This has a particular reason: according to the January 2018 „Beauty Trend Report 2018“ which was conducted by mobile research platform Open Survey, almost half of the people polled said that they made beauty purchasing decisions based on product reviews on blogs and social media posts. Basically, they don’t need sales advice from stoore staff any more. Enter the new „untact retail trend“ which is particularly visible in this new generation of health & beauty retailers. Customers are encouraged to linger in the retail stores as long as they want; sales staff will not approach them unless asked. There are plenty of product testers, plus everyone is constantly on their smartphones anyway, so there really is no need to offer unsolicited product advice. I noticed this new retail atmosphere the first time I entered one of the new Olive Youngs – and that was before I even found out about „untact retail“ from an article in Korean Joongang Daily. It was really pleasant to just stroll around the shelves and looks at the products in peace and quiet. Product photography: not that much (see intro paragraph! ), so I took secret pics. Shout-out to my amazing Huawei Leicaphone which has the best camera ever!! 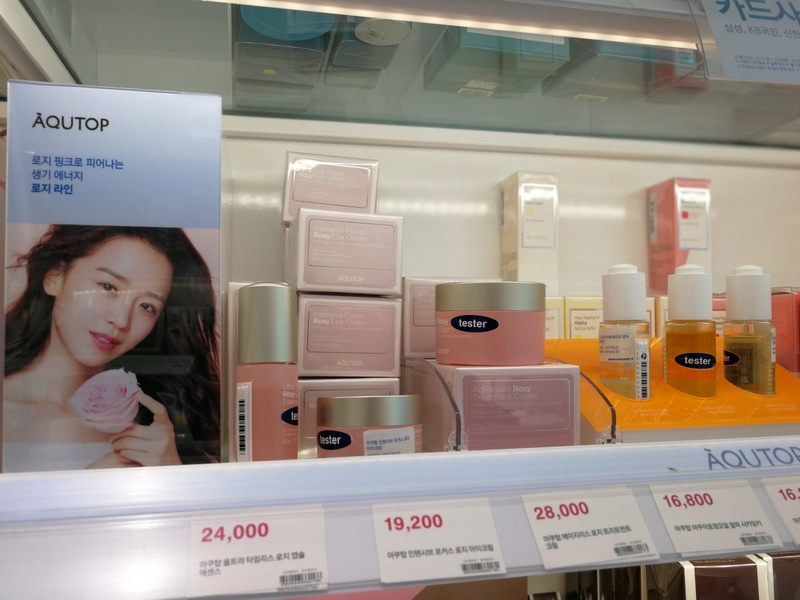 Yes, I know, technically Olive Young is not a new retailer – the Olive Young chain has been the health & beauty market leader in Korea for the past few decades and is continuing to do so still. However, with the arrival of the three new beauty chains Chicor, Boots and Lalavla, CJ Group has been feeling the pressure. 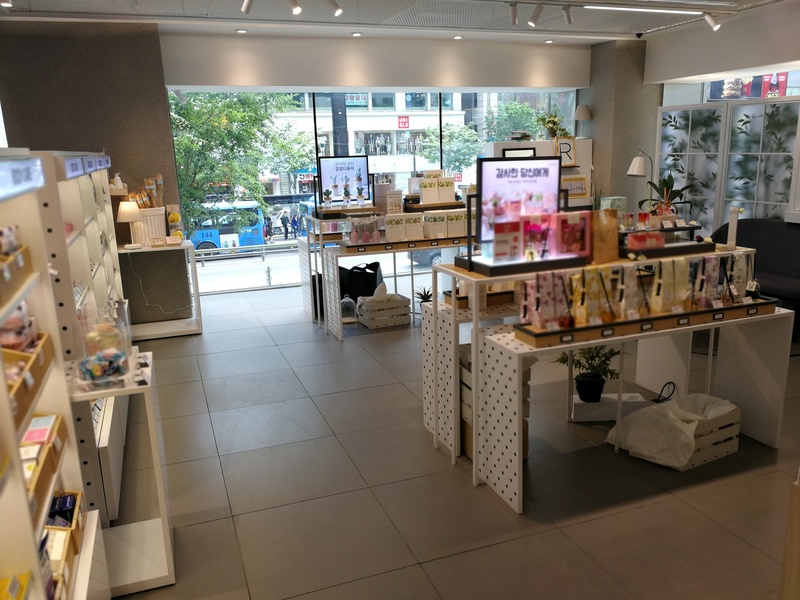 The company has completely (and rapidly) renovated its bigger stores in Seoul, including the Olive Young Lifestyle Experience Center in Myeongdong (which renders my March 2015 store profile woefully obsolete!). Olive Young had also opened several new outlets which offer a retail experience that is almost identical to what you’ll find in Chicor and Boots – several floors of Western, Korean and Asian indie and mainstream beauty, plenty of „playground“ makeup counters, special shelves highlighting newcomer brands; makeover counters, digital store/brand displays, instagrammable selfie areas and so on. As a poster child for this new generation of Olive Young „playground“ stores let’s check out the chain‘s new Gangnam station retail outlet (outside Exit 10). This is another massive beauty store, featuring three floors altogether. 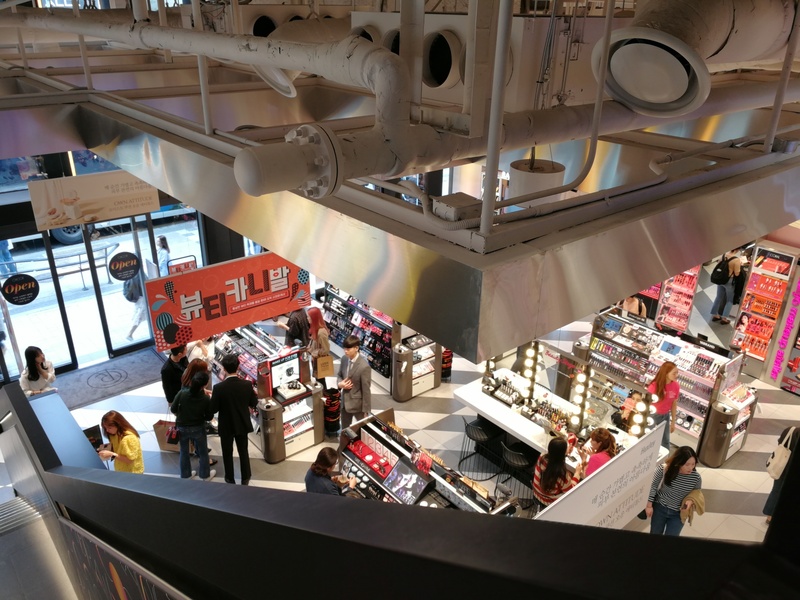 The ground floor is all about makeup: higher-priced Western beauty brands such as Mac, Urban Decay, Estée Lauder and Revlon are on the left, Korean makeup brands are located more towards the right. 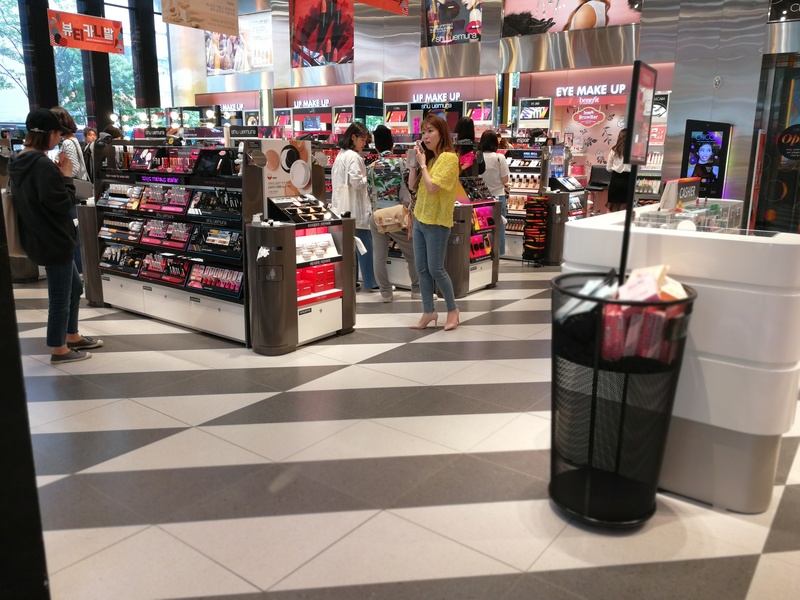 In the middle of this floor is a “Makeup Bar“, a proper playground area with large mirrors, tables and good lighting so you can try out the makeup as much as you like. There is even an eyelash bar which has fake eyelashes on small sticks that you can hold up to your eyes to see what this particular eyelash style would look like on your eyes. Brilliant idea! 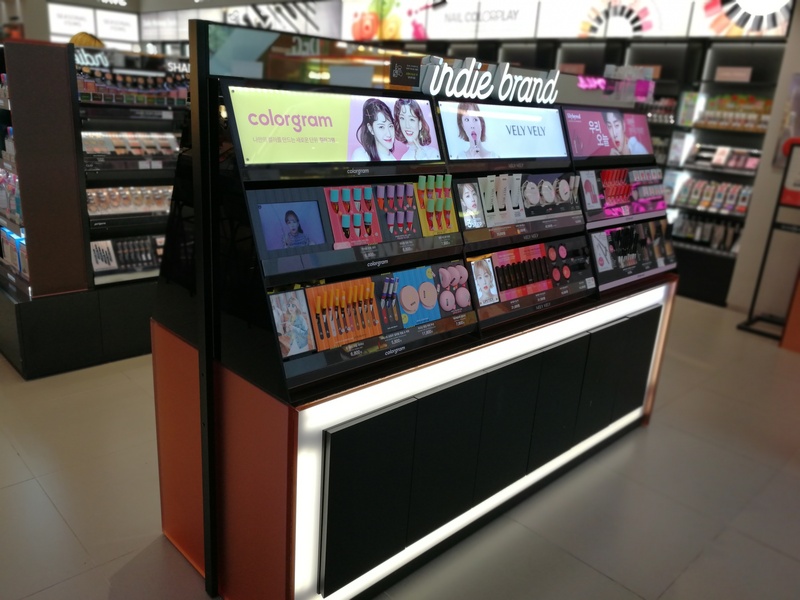 On the right hand side of the entrance is the Indie Brand shelf with domestic newcomer makeup brands– really interesting, I only recognised around half of the labels. First floor (2F): Skin care!! Face care and body care, with a massive section dedicated to sheet masks alone. 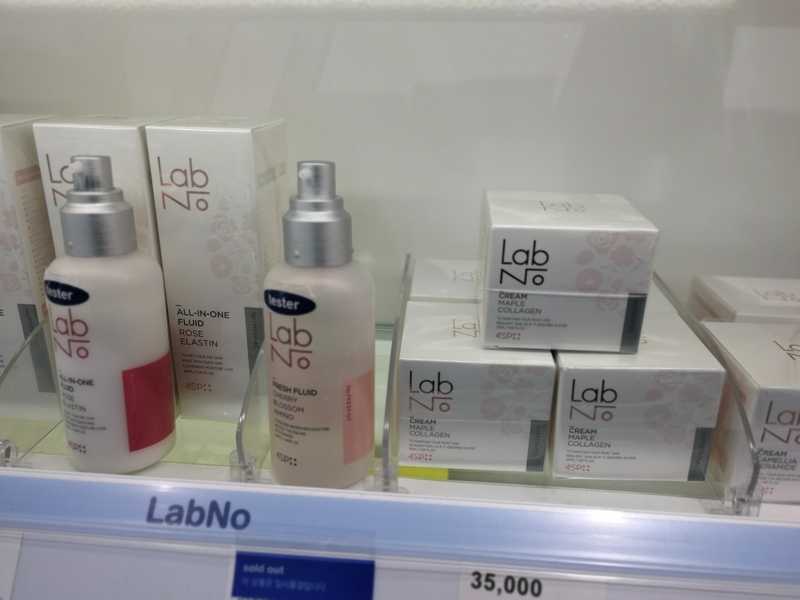 The brand line-up is more drugstore-oriented than Chicor (which is a straight-up perfumery) and offers a mixture of Korean mainstream – Dr. Jart, Isoi, Lirikos, Carezone, Goodal, Neogen, DermaLift, 23 Yrs Old and CNP Laboratory – and more niche-ey labels such as CosRX and Dr. Frog. Anyway, all of the usual Western and Japanese mass market beauty brands are also present – L’Oréal, Nivea and Neutrogena et al. ; Hada Labo, Perfect Whip, DHC and Bifesta (all from Japan) and luxury Western brands such as Clinique and Origins. The French thermal water brands brands (always a bestseller in Korean beauty retail) occupy at least a quarter of the floor space: Avène, Vichy, Uriage, Bioderma and La Roche-Posay are represented with their entire Asian product portfolio plus Nuxe (also from France) and Eucerin (Germany). Like a good little trend beauty retailer this Olive Young store offers the usual display counters of face oils (a strongly growing category in Korea) and serums/ampoules. This is also where I found organic newcomer brand Manyo Factory’s new bifido-galactomyces face ampoule! 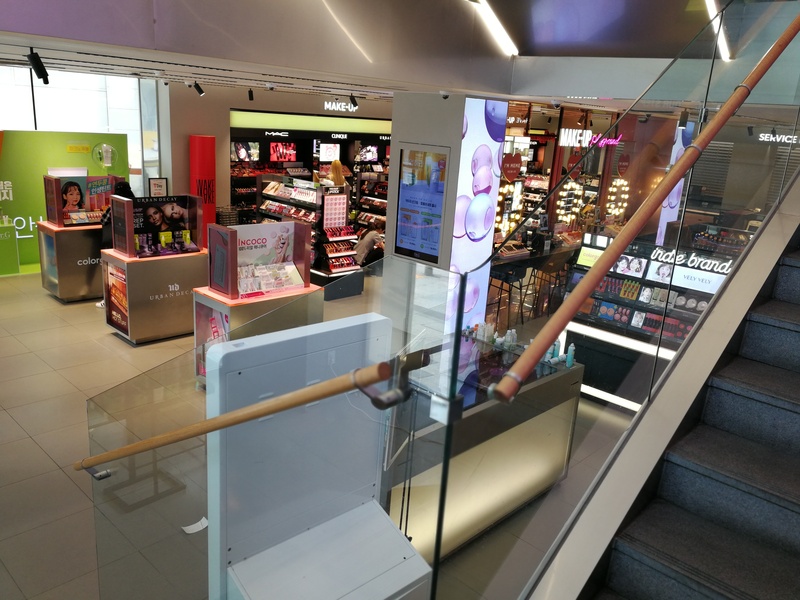 There is a wash basin display in the middle of the this floor – again, this is an integral feature of the new beauty playground stores: give the customers the opportunity to really try out foams, gels and lotions! 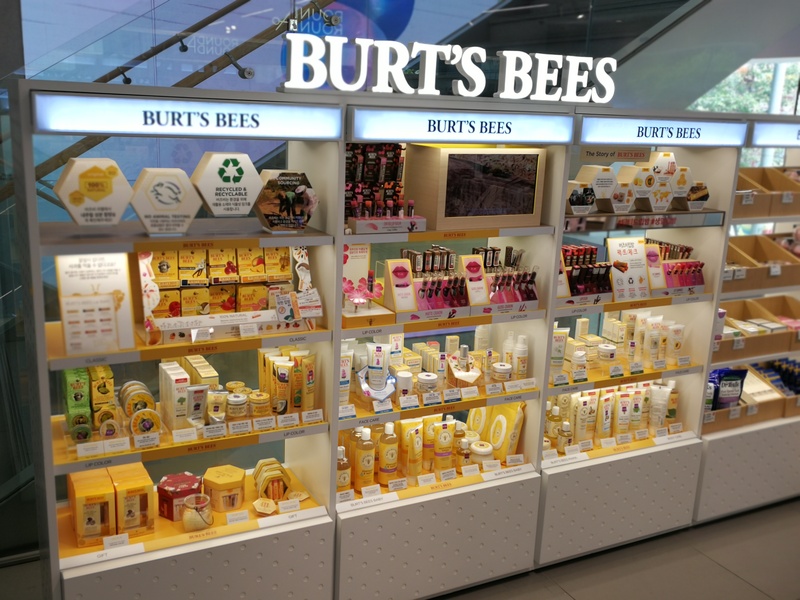 This floor also had the biggest Burts Bees product display I’ve ever seen: the entire range of skin care, hair care and body care plus all of the extra Asia-only product ranges and, in a separate brand display, a counter with the brand’s makeup range. Check out all of those gorgeous lipsticks, tinted lip balms, and conditioning lipsticks! 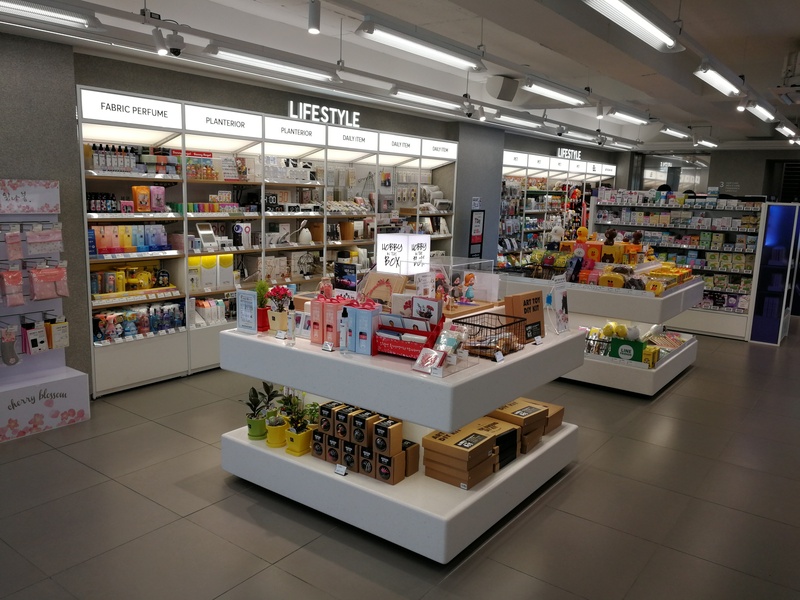 The third floor offers perfumes, home fragrances and lifestyle products – I must say, I do like the catch-all “Lifestyle” drugstore category: cool stationery, digital/smartphone gadgets, toys and accessories, imported confectionery; there’s always something new to discover. 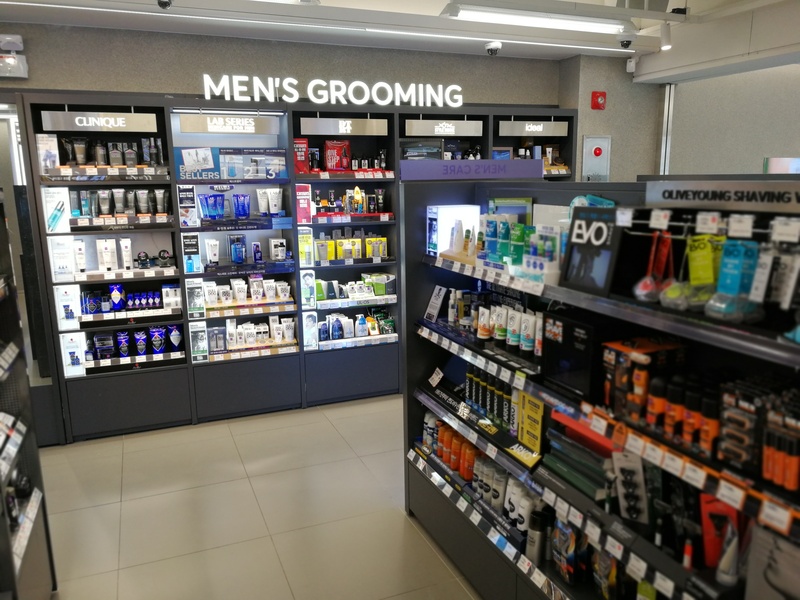 Here you’ll also find men’s grooming, hair care and hair styling; including Olive Young’s classic styling bar – a shelf with plugged-in hairdriers, tongs, curlers, straighteners and other heated styling tools. Strategically placed mirrors allow you to quickly restyle your hair and try out the different styling tools at the same time. Why don’t we have this kind of thing over here in Europe? Next to the Styling Bar is the men’s grooming bar with face care, makeup and styling products from various men’s beauty brands. 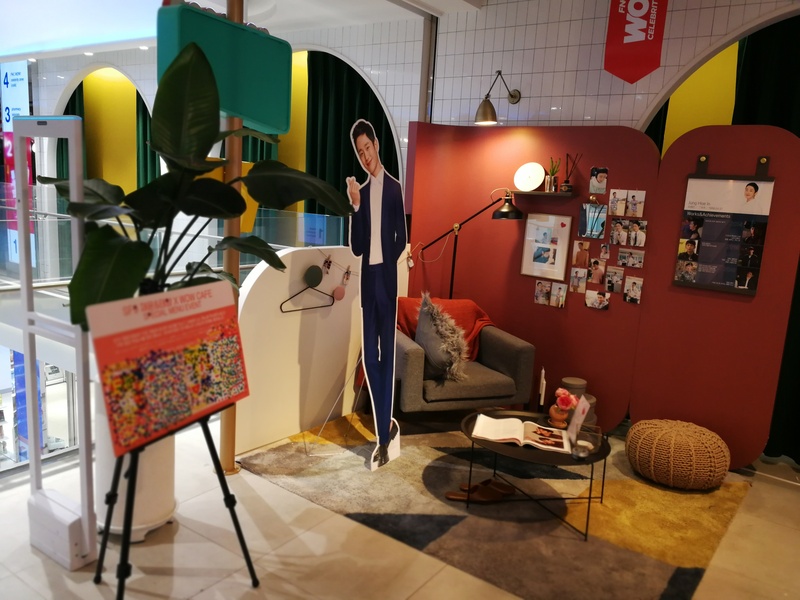 Note how spacious and bright the skin care and fragrance floors are, with so much natural daylight and there are even seating areas – this OIive Young feels more spacious than the Gangman Chicor (which seems to have lower ceilings in their first and second floors?). The Garosugil Olive Young even has a seating area next to its food/confectionery/beverage section so you can buy something to eat or drink, have a bit of a sit-down, and then continue to browse the store. Several larger Olive Youngs even have an actual café in-store – the Myeongdong Olive Young, for example, features a branch of café chain A Twosome Place on its first floor. 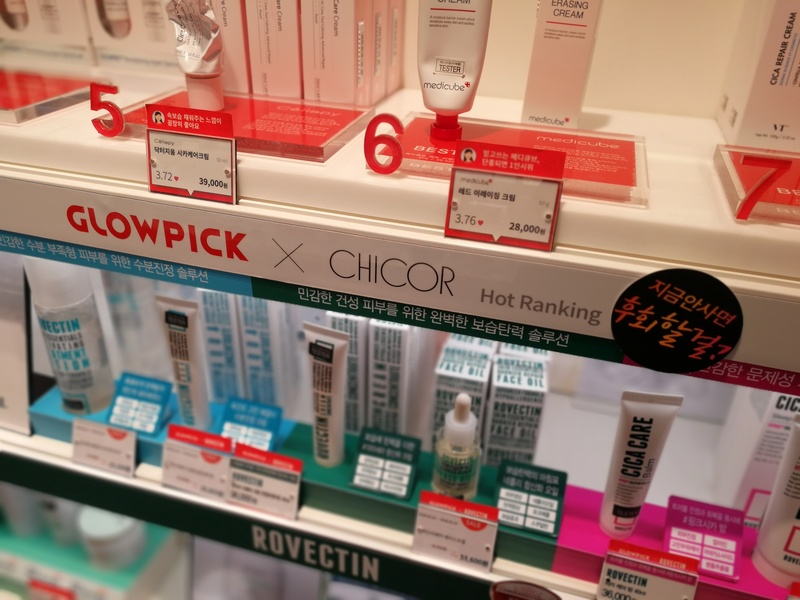 If you want to check out these new beauty retailers next time you’re in Seoul: the Chicor and Olive Young stores I mention above are both conveniently located in the same part of Gangnam area. 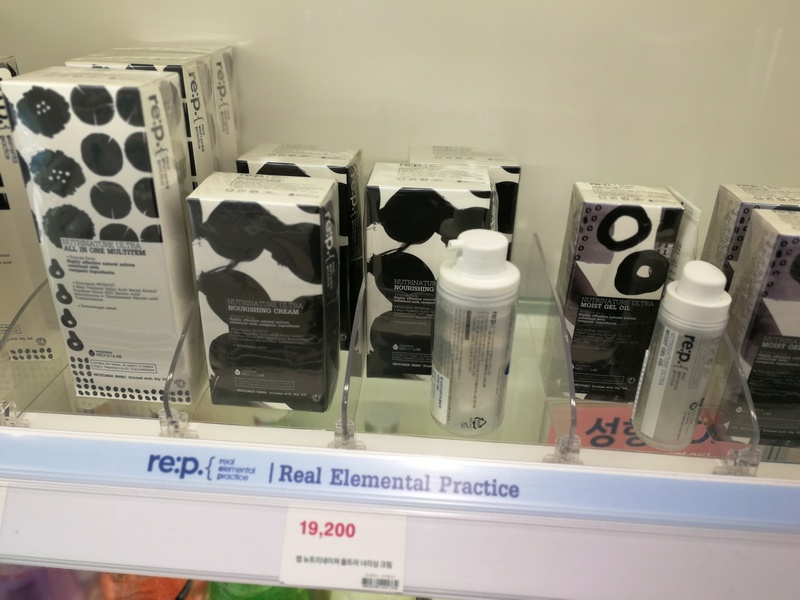 Get off at Sinnonhyeon station for the big Chicor and check out Korean organic and niche beauty store Cree’Mare at the same time! Cree’Mare is a very pretty store with interesting organic brands; it’s located at exit 3 of Sinnonyeon station. Gangnam station is the next station on the subway line; Sinnonhyeon and Gangnam stations are connected by an underground shopping centre but since Chicor and Olive Young are both above ground, it’s easier to walk along the street. The Olive Young is near Exit 10 of Gangnam station. The Myeongdong Boots is around the corner from Olive Young’s former Lifestyle Experience Store so you can cover these two outlets in one visit. And the big Garosugil Olive Young I mention in the article is located in between Sinsa station and Garosugil street – take the Sinsa exit towards Garosugil and you’ll walk past the Olive Young. 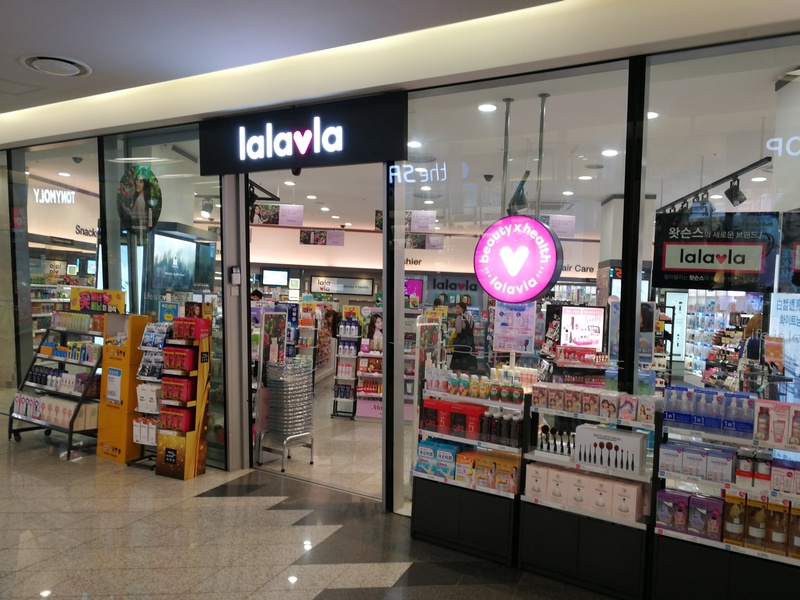 There are plenty of Lalavla stores in Seoul (both as stand-alone stores and shop-in-shops in various shopping malls and subway stations) so the chances are good that you’ll find a Lalavla no matter which part of the city you visit.